WILMINGTON, N.C. – Ever wonder how characters, props and creatures are made for television and movies? Take a behind the scenes look at the film industry with award-winning makeup, special effects makeup and prosthetics artist Jeff Goodwin. New Hanover County’s Cape Fear Museum and the Cape Fear Independent Film Network are excited to host Pulling Back the Curtain: Special Effects Makeup on Friday, May 13, 2016 at 7 p.m. Learn some of the techniques and processes that artists use to make the movies magic for audiences. 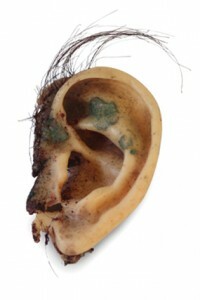 Did you know Goodwin made the ear for David Lynch’s cult classic Blue Velvet, and used real human hair? Hear how Goodwin created the iconic ear, and many other props! Goodwin’s credits include Rambo III, The Last of the Mohicans, the original Teenage Mutant Ninja Turtles, Empire Records, Ang Lee’s Ride with the Devil, A Walk to Remember and War and Peace. Admission is free for members and students with ID and $5 for non-members. After Goodwin’s presentation, tour the Starring Cape Fear! film exhibit to see some of his work as well as other film and television artifacts from productions filmed in the Lower Cape Fear region.